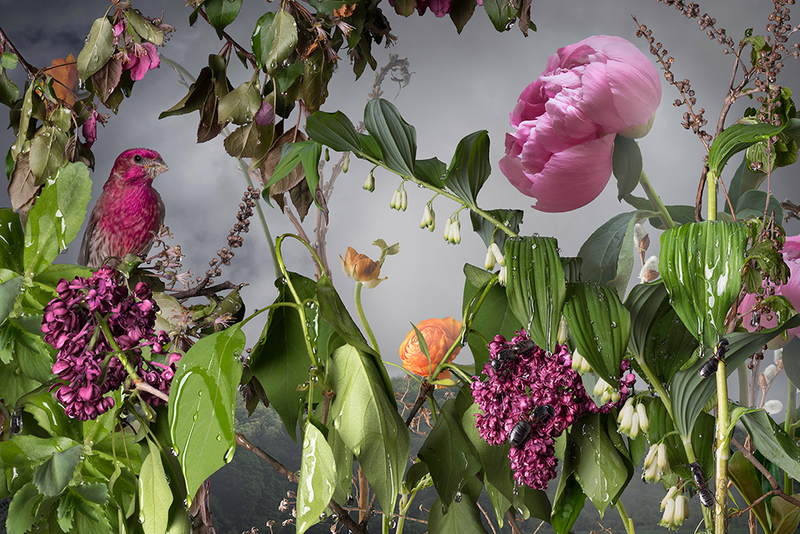 Jason DeMarte explores the use of natural themes in marketing and its influence on the consumer in three series: Confected, Utopic, and Nature Preserves. 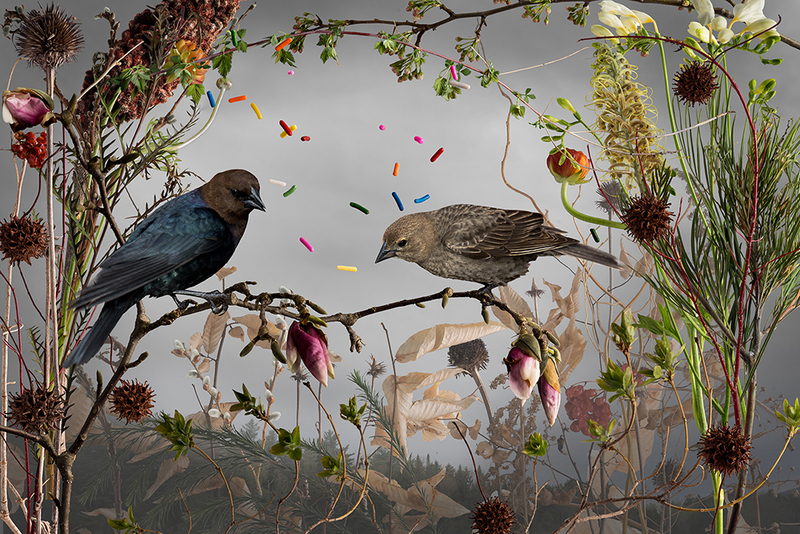 In Confected, he carefully arranges objects once found in nature—such as flowers and taxidermy birds—intermixed with bright, artificially colored food products. Photographed separately, the objects are meticulously composed and edited into a single digital image. The final product recreates these elements into noticeably unnatural, yet somehow familiar, arrangements. For the series, Utopic, DeMarte contrasts picturesque portrayals of animals in their natural habitats with overlaid patterns of bold color sampled from advertisements and commercial packaging, awkwardly merging organic and material forms. In a similar fashion, the series Nature Preserves contrasts manmade items alongside idyllic landscapes of the American frontier. 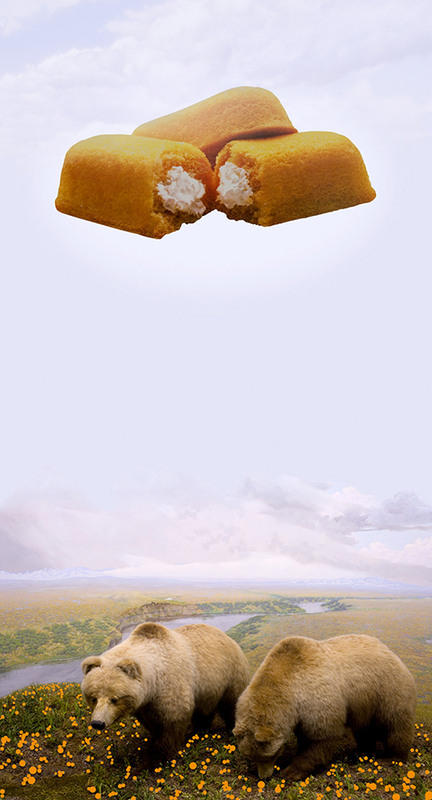 By using imagery emblematic of Manifest Destiny, a movement for westward expansion in the 19th century, DeMarte draws a line of comparison between this period of American history and current trends in consumer ideology. Similarly to how images of American westward expansion idealized the frontier, in today’s market, advertisements promise a better life if one uses their product. 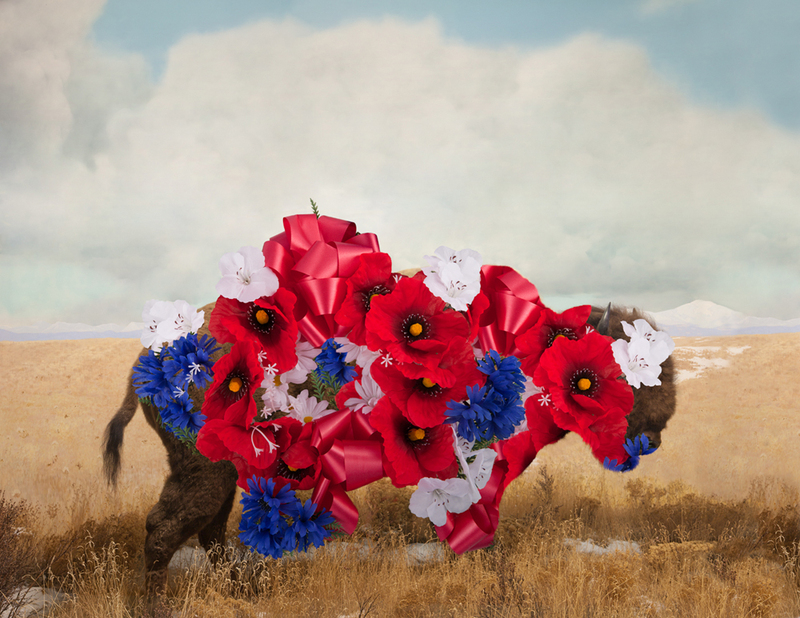 Strips of fake bacon suspended above the plains and buffalos shrouded in artificial flower arrangements serve as a reminder that this spirit for what is “bigger, better, faster, easier” is still present in American culture. Jason DeMarte completed his BFA in Photography from Colorado State University (1997) and his MFA in Photography from the University of Oregon (2000). 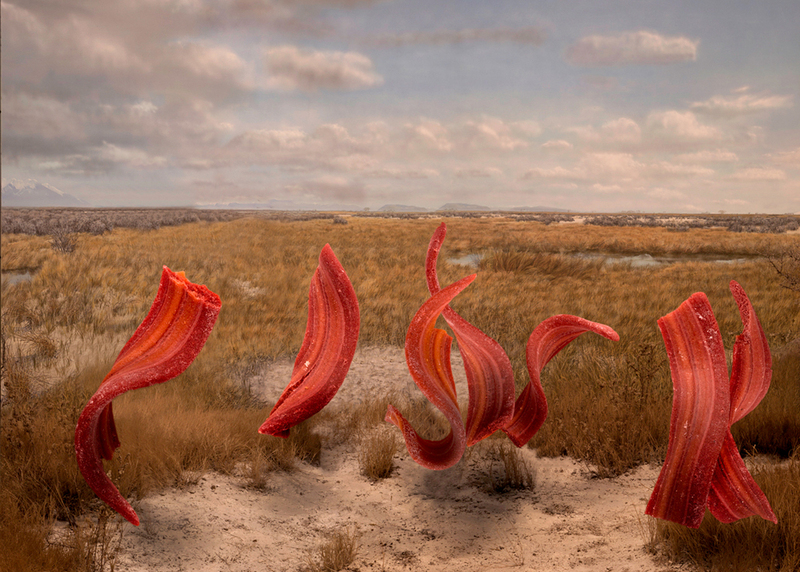 His work has been exhibited at the Rule Gallery, Denver, Colorado (2009), Wessell Synman Gallery, Cape Town, South Africa (2010), and the Detroit Center for Contemporary Photography, Detroit, Michigan (2012), among others. 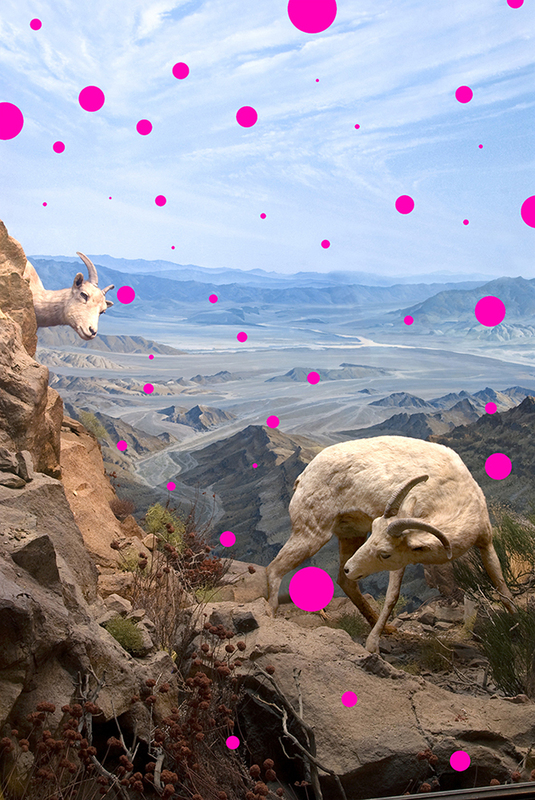 His works are included in the permanent collections of the Los Angeles Center for Digital Art, Los Angeles, California, and Fort Collins Colorado Historical Museum. DeMarte is currently a tenured faculty member at Eastern Michigan University.